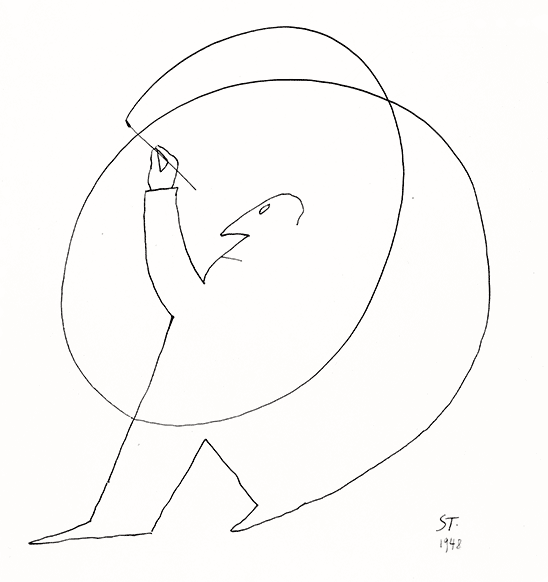 Steinberg’s more conceptual shift around 1960 also led to the full realization of visual devices he had flirted with earlier, among them, the thought balloon. The words in the dialogue bubbles that had long served cartoons and comic books as narrative containers metamorphosed into images; or, as in The Americans, translated into faux calligraphy to signal the mindless chatter of a cocktail party. Confusion in the face of new technologies is rendered as a hodge-podge of doodles. Elsewhere, a stodgy capital E imagines self-improvement in the form of a slender, accented French letter. And then romance: a man dreams that his woman is dreaming of him; a male 5 and a female 2 sit across a table, the 5 envisioning the mathematical calculations that will seal their relationship.